I’ve been laying fairly low the last couple of months. I’ve travelled heaps and I’ve been working on getting my fitness back to good levels since a bunch of time off after Xmas. I was busy doing many talks around Ireland, it’s something I’ve really enjoyed especially giving talks to School kids. I’ve also been waiting around for a call to Dive which came last week from my old company Technip. I was asked to attend an extensive diving medical in Aberdeen for a deep diving job currently ongoing in Libya. So I jumped at it. The job is heavy construction work at 200m depth in low visibility water. The medical involved a Bruce Protocol V02 max test which I had not done before but after looking up what it entailed I was fairly confident of passing it. It differs from a normal V02 max in that the incline increases every 3 minutes. Also if a candidate hits their theoretical Maximum Heart Rate (220 bpm minus age) before they can achieve 44ml/kg/Min then it’s a fail. A lot of guys have been failing it, I’m sure that most experienced blokes I know are fit and capable of diving at those depths without issue but if you don’t run hills at all, you’re in for a rude awakening when the treadmill hits 16% incline. Luckily for me a little hill suffering is one of my favourite things to do and probably one of the most beneficial forms of cardiovascular fitness I’ve found. I stopped the test at 22:19 at a 24% incline and my HR had hit 182 just shy of my 183 max and a score of 58.5ml/kg/Min. Pretty happy with that. The rest of the medical was 7 point drug test, ECG, hearing, eye, urine and all the regular diving checks like neurological assessments. So I’ll be shipping out to Libya next week via Malta. I recently did a Q&A for the print magazine Avaunt. So I’ve added it below. It can give anyone a good insight to what my job entails. Can you explain what Saturation Diving is and what different components are there to the equipment and different chambers? Saturation Diving or Sat Diving for short is a special protocol used to enable divers to go deeper for longer. Regular diving involves going off the side of a boat and coming back to it usually not more than a few hours later, to come back some times divers have to decompress which is allowing the compressed gas within the tissues to diffuse out through the lungs. Depending on how long a diver has spent at the deepest depth of the dive, determines how long that decompression is. Usually a scuba diver will have in water stops on the way up to allow time for the compressed gas to come out of solution, much like the bubbles on the side of a glass of Champagne. Sometimes this could take hours. If you come up too quick these bubbles form in your blood vessels in the same way they appear on the walls of the glass of champagne, this is called the bends and the biggest danger to a diver. With Sat Diving the dive begins by compressing inside a cylindrical chamber which is inside the hull of a large boat called a DSV (Diving Support Vessel) These are ships up to 160m in length with over 100 people working onboard. They move around to different oil and gas fields throughout the world performing construction and maintenance tasks on the platforms. The Sat Diving complex is housed deep inside the DSV usually made up for multiple chambers. Each chamber sleeps 3 or 6 divers, the teams are made up for 3 men and at one time there could 4 teams working around the clock on different rotations. Living on dry land you are at 1 atmosphere of pressure, at a depth of 170m we are at 18 atmospheres of pressure. Being at this 1 atmosphere you are saturated to that amount of gas, meaning your body cannot take on anymore gas. We do the same by becoming saturated to whatever depth we are working at, once saturated we can stay there indefinitely until time to decompress. So we stay in this small chamber no bigger than the back section of a bus! For up to 28 days at a time! Everyday we go from the living chamber via a string of tunnels called trunking, much like a hamster tube into whats known as the TUP (Transfer Under Pressure) where we climb up into another small chamber called a “Diving Bell’ from here the bell detaches from the main system and is winched down through the bottom of the ship via a ‘Moon Pool’ or hole in the boat. The bell stops about 10m from the sea floor. From there 2 of the divers get out and go to work on the bottom for 6 hours. 1 man stays in the bell and monitors gas mixes and valves. He also tends the divers hoses, these umbilicals tether the diver back to the bell and is our lifeline. It contains our gas mixture which is a Heliox mixture (Helium and Oxygen, yes we sound like chipmunks) It also contains hot water, comms and lights. We wear large fully enclosed diving helmets, we can talk to each other and the supervisor on the surface who runs the dive. We also have a camera and light on our heads. We are usually doing such things as pipe hook ups - putting sections of pipe together that can be up to 60 inches in diameter, we work with big cranes and remote operated vehicles. It is varied and sometimes interesting work. After our stint on the seafloor we return to the bell and then the main living chamber. Here we sleep and eat, food comes in via the sidewall of the chamber in a hatch called the ‘Medical Lock’ we eat off a menu from the main galley of the ship and sometimes the food is pretty good. We repeat this daily process for about 21 days then spend the last week decompressing, slowly we return to atmospheric pressure. We don’t move from the chamber this entire time and yes sometimes it really drags on! After we’re out we have a bend watch for 24 hours and then we are free to get off the vessel for our time off! What sort of training and over what time length does it require to qualify? To qualify as a basic Air Diver takes 3 months, from there you need to work in onshore projects gaining enough experience to get a start offshore on the rigs where most people want to end up. After a certain amount of dives at certain depths, you can qualify to take the Saturation Diving course which is about 5 weeks long. The process can take anything from 2-6 years. What sort of people are attracted to saturation diving as a career? Diving attracts a very varied bunch of people and is one of the reasons I love it, guys from all over the world usually with colourful back grounds! Naturally a lot of ex forces guys end up diving, it’s sort of run in that manner as well as it is a dangerous job. But anyone can be a diver, some of most unsuspecting guys make the best divers. Sat Diving really isn’t for everyone, many guys don’t enjoy the living in the chamber part, you can’t just get out and go home, decompression takes up to 7 days and it’s quicker to get back from the moon than it is the depths we work at. You have to have a certain mindset to be able to live in a small chamber for sometimes 120 days in a year. The Pros are obviously the money which is important, but the time off as well is great as I can take months off and do alot of the things I want to in life without feeling tied to the job. Also some of the things I’ve seen subsea and locations I’ve been in have been amazing. 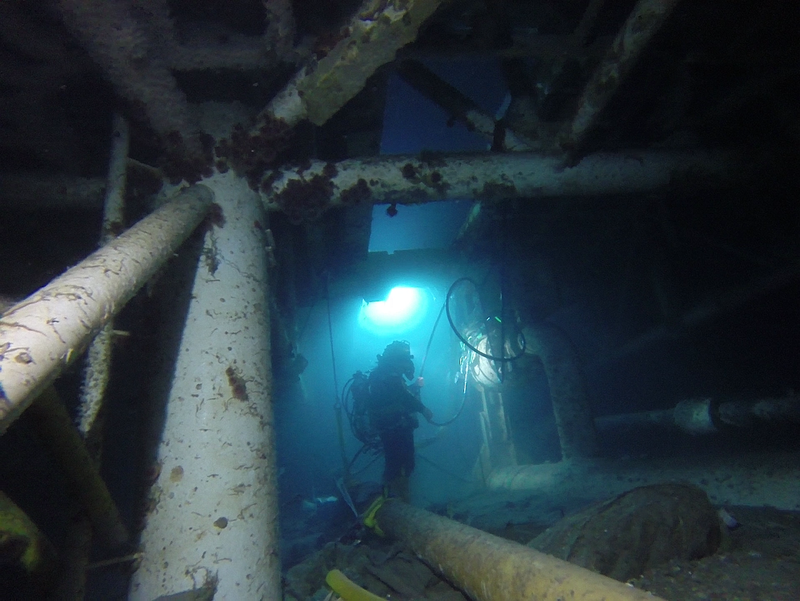 To be stood on the side of a oil rig member 120m below surrounded by every fish imaginable is fantastic. 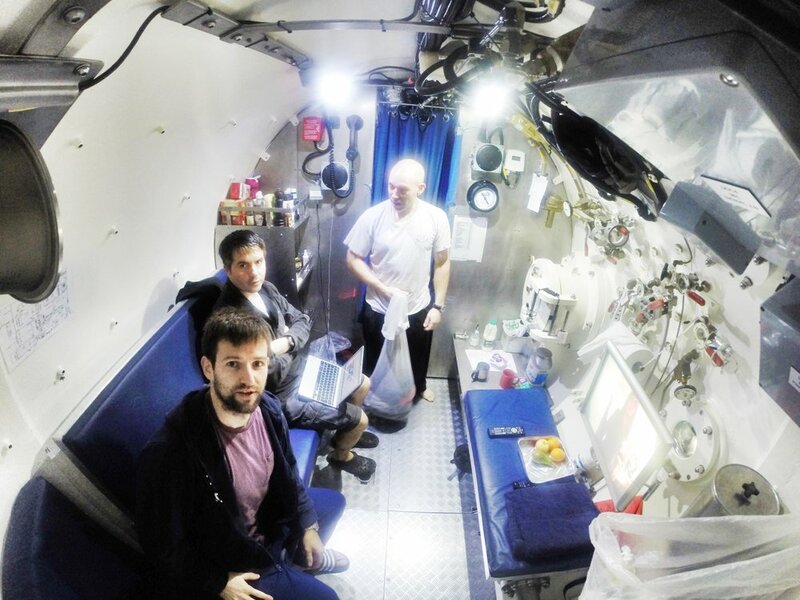 What does it feel like living in a tiny pressured environment under the sea? The biggest misconception with Sat Diving is that we live under the sea, we spend our working day down there, the Bellman which is a job you have every 3rd day or your day off from diving, is when you spend the most time there, otherwise you’re living inside the boat like everyone else but you can’t go outside and get some air or walk around much! We get TV & WiFi in the chambers, I also read and listen to podcasts, but usually I’m day dreaming and planning my next adventure! What are the scariest moments you’ve ever had? I’ve had a few moments when I’ve come close to being squashed by large sections of pipe or big tools, equipment is usually lowered down by crane to us, but often we work in zero visibility due to the bottom being muddy, we can sink into it up to our waist feeling around for things. Its the other side to the job. If the tide is running and the seas are a bit rough a load coming down can be all over the place, not being able to see it and having to manage your diving hose also makes it very hazardous. Many divers have lost the ends of their fingers. I’ve had my diving hosed pinched by a crane load and my gas started to run out, we have a spare bottle on our backs as back up, I turned that on and quickly went about finding my hose caught under a 3 ton concrete mattress , luckily I was able to free it before my bottle ran out, otherwise I would not have being able to get back to the diving bell! Do you feel like a mercenary working for short periods of time around the world in a potentially dangerous environments for good/great money? Yes totally, I’ve worked some wild places including Nigeria, Iran, Azerbaijan but always love going to different places, my next job is in Libya. It’s a hard crazy lifestyle, you can get called in the middle of the night to go on job half way around the world and ben gone for 3 months. Do you enjoy it or is it a means to an end? I’m still on the fence after 14 years! There are aspects to it I really enjoy like the guys I work with, the diving can be amazing. I really enjoy manual labour, I still treat every bell run like a sporting competition, I get nerves beforehand and always want to perform well, if you're busy the time flies and there is a sense of completion when you get a job done. But it can be very grim at times, spending too many days in a chamber can really mess with your head, also not knowing how long you’ll be gone for, where the next job is coming from and so on, but it really suits me and my lifestyle to be in it. What can’t you live without down there? I’ve arrived on a job where my bags never made the flight, so I’ve gone in with next to nothing. But I do need a good book for the days that I am bellman as it can be a long 6 hours sat in the diving bell while the other 2 divers are out working. What do you miss most on land? Just the simplest of things like a normal toilet instead of sharing the same stainless steel one with a bunch of blokes that is very uncomfortable to sit on! This is a picture of Henry and me on a tea break in his house during one of the many days we spent working on my boat, ‘Doireann’. His walls are covered in pictures of sailing trips he took with his wife Marina. His basement is an intricate man cave with all sorts of tools, gadgets and even a 3D printer he built himself. Henry was one of the smartest people I’ve ever met. He was a highly skilled engineer but the rare kind that could actually work with his hands. The first time I met Henry was at Renville slipway. It was my second outing with my boat and I had just recovered it from a small row during which I was doing my best to avoid banging into all the nice boats on moorings. A few months before this, I had decided to row the Atlantic solo; with no rowing experience or technical knowledge about boats, I really hadn’t a clue what I was doing. Henry came walking up all excited asking a bunch of questions about my Doireann, named after my niece. Most encounters with people previous to this led to questions like ‘where do you sleep?’ and ‘where do you go to the toilet?’ But Henry started asking about hull construction, autohelms and chart plotters. It was clear from the outset this boyo knew a thing or two about boats. Our chat went on for the best part of an hour, my initial thought was ‘this guy is awesome’. He went on to tell me he had sailed the Atlantic and was a rower in his youth. In fact, he owned probably the nicest boat in the bay. Before I set off, Henry asked where I was storing my boat; I kept it in Annaghdown, which was far away from the slip. He then offered for me to keep it in his house, a 5 minute drive from the slip. Of course I took him up on that offer. From then on, in my bid to row the Atlantic solo, Henry became my friend, wingman, teacher and mentor. Along with his lovely wife Marina, he welcomed me into their home and we spent many hours talking weather, kit and what it’s like out there in the middle of nowhere trying to solve problems like a broken mast, as they did when they sailed the Atlantic. I’d often come over to his house to find him inside the cabin of the boat with the panel pulled off checking electrics and taking notes; by the time it came to the row, he knew the boat inside out. I would regularly get random emails off him in the wee hours titled ‘brain dump’ with a lot of information on all things boating. Information, facts and ideas constantly flowed from Henry’s mind. He designed an emergency rudder construction to be made from a spare oar. He made parts for the boat with his 3D printer; nothing was spared. I could call or email anytime and he’d be right on it, buzzing with ideas and solutions. Henry lived in the Solution. Aside from all the tech side of the boat, himself and Marina went out of their way to help me plan passages and training rows in the bay and further around the coast. They kept their boat ‘Beoga’ in Baltimore over the summer months to enjoy great sailing in West Cork. But mostly they seemed to be helping me, towing me out into the Atlantic so I could train. They brought me on my first night passage as I rowed along the coast of West Cork during a meteor shower, their boat light close by as I rowed through the night, semi seasick, loosing count after 50 meteor sightings. At the end of the summer Henry wanted to get me into more serious conditions and test all my systems before embarking on the Atlantic. Ocean rowing boats around coastlines like where we’re from is not a good mix. So a lot of care and planning needed to be taken. We planned for me to row from the Dingle Peninsula to Galway and spend 48 hours on the boat along one of the most treacherous sections of coastlines in Europe. We wanted specific weather conditions and it came together in mid-October. Henry drove me down to Castlegregory pier, where I’d set off from. This would be a small dress rehearsal. He got me away in the afternoon with light winds keeping me away from the Shannon Estuary and Loop Head. He scurried back to Galway watching the tracker as I slowly moved north. I rowed into the night with the lighthouse from Loop Head beaming brightly,. In the middle of the night, after nearly 12 hours of rowing, I had to get some sleep; I set my autopilot so as to keep on track. But the light south-east winds became a lot stronger and began pushing me further offshore. I was awoken suddenly around 4am after 2 hours of sleep by the satellite phone ringing: it was Henry asking was I aware of my current position. I was very surprised to see how far I had drifted offshore, almost 20 nautical miles . Loop Head was a tiny light in the distance; my heading was pointed to Iceland. Further investigation as to what was happening revealed that one of my autopilot motors had burned out and I was basically drifting with the wind. I had no choice but to deploy the Para-Anchor and sit tight. A big south-westerly was on its way and we knew this would give me the platform to fly up the coast and into Galway Bay that day. After some waiting around, the SW winds started to pick up and I pulled in the sea anchor and took to the oars. I began making great ground – positive texts were flying in from Henry. I set my heading for Inisheer and got stuck in. About halfway through the day, the winds were really gusting; wave height got up to 4–5 m of open ocean swell and I could see the Cliffs of Moher in the distance. I took a break after a while and jumped in the cabin; I had the music on and had been enjoying some very fast downwind rowing, surfing the ocean swells and getting up to 10 knots of speed on some waves. I had a lot of missed calls on the sat phone, all from Henry. I immediately called him; he told me straight away to adjust my course: in the midst of my ‘fun’ I had been steadily heading toward the cliffs. The SW winds were due to turn more west later that day and I could easily end up on the rocks. That particular day was Henry’s birthday and they were having a party at his house. But Henry was on the verge of leaving it and heading to Liscannor to rescue me with a RIB he was organising before he got in touch with me. I apologised profusely and got my head in check . Over the next few hours, with Henry guiding me on the phone, I made a good and safe track for the lighthouse at Inisheer, to squeeze in between there and the Clare coast, giving myself as much room as possible. Late that night I made it back into the relatively safe waters of Galway Bay but still had a ways to go to make it to Renville. The winds picked up considerably out of the west, pushing me directly to where I wanted to go – so far so good. Usually when I came back into Renville, it was during the day: I would aim the boat for one of the moorings and then hang over the side and hopefully grab it; I needed to be going very slowly and not being able to see whilst in the rowing position always made it tricky. Now, though, it was next to impossible, all I could see was pitch black in front of me and two tiny channel lights to guide me into the bay. I had all the lights out on the boat in a bid to see where I was going. It was 3am and the winds were getting a bit out of control, gusting at 35 knots. Even without rowing I was still going too fast to be able to safely grab the mooring. I deployed one of my drogues (a small parachute to slow the boat down) but that didn’t do much, so two more went out, I was still moving at over 1 knot. I threw out a 5-litre drinking container to add more drag. The closer I got to the moorings, the more I realised I was in trouble: with all the drag I could barely steer and I started to head toward the rocks and miss the moorings. I knew I had to drop anchor and dug it out of the aft storage quickly . I got it out just in time and stopped myself 10 m from the rocky shoreline. The anchor held but I was in a mess of lines off the stern from the drogues. It was high tide so I was secure for now. The winds raged on. I wondered what my next move would be. Surely Henry was asleep and hadn’t seen the mess I had got myself in. After a few minutes of gathering myself I was blinded by headlights coming over the hill and along the small road by the shoreline. Out jumped Henry, Marina and their dog Yoda. The winds were so strong we couldn’t hear each other shouting. He was telling me to sit tight. He went back to the slip and launched his dinghy and outboard engine. He came over to me and tied off to my stern. I began gathering up the drogues. He instructed me to pull the anchor on his call and he would drive the dinghy hard while I would steer the boat and hopefully get me back across to the mooring. I hauled the anchor on his shout and we buzzed away from the shoreline and back onto the safety of the mooring where I tied my Doireann up. So I had come to rely upon Henry during my preparation. I felt so fortunate to have someone like him on hand to help me. During that summer, a friend of mine who knew him asked me how Henry was doing. I replied ‘ya he’s great, what do you mean?’ ‘You do realise he has cancer?’ Then the penny dropped. I felt terrible; I hadn’t realised but it did make sense. I spoke to Marina the next time I was around the house, apologising that I didn’t know – She thought I knew, she was pretty cool about the whole thing. Again I emphasised that if all this was putting too much strain on him, we’d stop. She then told me about the day he came back from meeting me for the first time and how he wouldn’t shut up about this amazing boat and this guy he met who was going to row the Atlantic. About how this was good for him, to have something to focus on, how his mind loves to churn through problem-solving and work on projects. I realised Henry was the only person who could get his head around this whole thing and was thriving on it. But it changed everything for me and my outlook on the row. All of a sudden I felt even more determined to succeed. When it came time to go to the start line in La Gomera, I had really hoped Henry could make it out there to help and see the start. But he was getting heavy chemo weekly and had been through a lot of operations since getting cancer a few years previously. I remember scrambling to put things together in the last few days and having him on the phone to help. I had to reassure myself that he was only a phone call away when I got out there. And so I set off on an adventure of a lifetime after months and months of preparation. I spent 49 days on the Atlantic Ocean alone. The great paradox of doing this solitary act is that it couldn’t have happened without the help of others. I had a few close people that I stayed in touch with: my sister Rowena, my good friend Kevin, my weather guy Leven, Sandy who has helped me prepare mentally and of course Henry who I was in contact with the most out there. Even though Henry could have handled my weather, we decided to get Leven to do it as he was a very experienced ocean rower and would know the performance of the boat. The tracker would update every 4 hours and within moments of that happening I would get a text from Henry without fail 6–8 times a day. He would send me my miles covered and the positions of the other boats near me. I was in a race from the get-go down to the very last hour of the race. I came third overall but I had a three-man American team on my tail for the last couple of weeks. I built up a sizable lead ahead of a chasing pack of five boats. But after the halfway point, the Americans started catching me day by day. I rowed 16 hours a day, sometimes more. I would sleep in 20-minute bursts and a little extra in the middle of the night. I was a sleep-deprived zombie rower by week 3. The rowing was the easy part, remembering the basics and making decisions was the hard part, but Henry was on hand sending reminder texts: ‘clean your panels daily’, ‘swap out your autopilots’. At one stage I got so confused with the compasses, I had him on the phone to me explaining how to adjust the declination on the autopilot as I changed latitudes. Henry wrote numerous blog posts for my website during the row, explaining technical weather language, navigation and equipment in layperson’s terms. I remember calling him a few weeks in on a day with no wind, chatting to him for half an hour on the sat phone, which cost an arm and a leg, just sharing the experience with him, telling him about the deathly silence that day. How I nearly capsized the week before and hitting 15 knots surfing down a wave. He recounted his time out there too and about how different the clouds are, how quickly they change. I knew part of him wanted to be out here with me. Toward the end of the crossing, the Americans got closer and closer to me but I did my best to not let them catch me. I asked Henry to send me updates through the night and he did; he probably was getting less sleep then me, sending updates at 12am and 4am. By the last 24 hours the Americans were less than 10 miles from me; I kept the sat phone on deck between my feet. Henry kept sending texts, telling me to drive on. I pretty much rowed the last 24 hours straight. I hadn’t eaten a cooked meal in 2 weeks – all I ate was rice pudding rehydrated with cold water. I pissed myself in the rowing seat. I was a man possessed. I finished just over 1 hour ahead of the American guys. I wished Henry could be there at the finish line to meet me; I had kinda hoped he would surprise me, but alas, he was still getting weekly bouts of heavy chemo and spending more time in hospital. Rowing the Atlantic was something truly bigger than me; I hadn’t a clue what I was doing to begin with. It was a crazy idea but I followed my gut, not my logical mind. I truly believe when you get past the fearful, doubtful mind that tells you not to do something, then doors will open where there were no doors before. Henry was behind that door. My mother believes he was my guardian angel. Henry taught me so much about life. I chose to be out there in the Atlantic. I’ve received great accolades for what I did, but it was all my choice, so no matter how bad it got out there, no matter how sleep deprived, scared, sore, and fed up I got, I always remembered that it was my decision to put myself there. Henry did not choose his lot, cancer took him as it took many but he acted with grace and dignity throughout, he shouldered it with not a care and continued to live, no matter what. People say life isn’t fair sometimes; to me life isn’t fair or unfair, life is just life and one thing it wants to do is live – that is an undeniable fact. That’s what Henry did, he continued living; he always had a job to do on the boat and a plan for another project of some sort. When I came back from the Atlantic, I announced that I wanted to row back from NYC to Ireland. Everyone thought I was mad and tried to convince me otherwise. Once I told Henry he immediately set about planning it, no questions asked. No matter what crazy idea I could have, I’m sure he would support it and help trash it out. That is what I will miss most about him, a truly scintillating mind, teeming with endless possibilities. Henry knew the key to life: that no matter what crap you are going through, no matter how bad you feel, that if you help someone else your spirit will be lifted. Henry embodied selflessness; if he could help you he would, it was always about others and less about himself. What Henry did, for not just me but many others he touched, cannot be overstated. He was one of the greatest humans I had the pleasure of knowing. His life has inspired me to live on through my own adventures and I promise to carry his name with me and continue to tell the story of the great man that was Henry Lupton who did everything and anything to help me realise my dream. Homecoming at Dublin Aiport post Row, Doireann in the front with all the people who mattered the most. I just watched my friend Kiko Mathews start her Atlantic row from Gran Canaria this morning, a long time coming for her and really proud of what she has done in the process, battling her own illness and inspiring a lot of women in Adventure. Also Damian Browne is 49 days into his crossing, with a couple more weeks to go. His videos have been hard to watch at times as he is a real as it gets. He is struggling to get comfortable which i know all too well about. While these 2 nutters are on the adventure of a lifetime, i'm looking back over mine as it was a year ago today that i finished up in Antigua after 49 days on the ocean. A lot has happened since then. More than i could have imagined. But one thing the Atlantic left me was hungry for more adventures and challenges. But it's not all gone to plan. I wanted to row back across the North Atlantic but i sustained a stress fracture in my back from the initial crossing. I dusted myself off and looked ahead to whats next. The draw of the cold and the wilderness called again and i planned to go to Alaska this month to take on the Iditasport. But in the last couple of weeks i've discovered another injury and another stress fracture in my hip that i sustained in November. So i've had to pull out. The last few weeks have been tough as i'm natural reaction would be to set another challenge and just focus on that. But i've been in a funk and struggling to do much of anything. I'm not sure of my next move, it's a time of reflection and hibernation! I took down the blog over the summer as I was away working and hadn’t posted anything in months so decided to remove it for the time being. I went back on a diving contract in Saudi Arabia to replenish the bank account. I had taken 18 months off since my last dive. In that time I climbed Ama Dablam 6812m in Nepal and made an attempt to climb Annapurna 8091m in winter. I raced the Yukon Arctic Ultra 300 Miles and 3 weeks later I crossed frozen lake baikal in Siberia alone over 17 days and 700km. I then spent a lot of my hard earned diving money on a carbon fiber ocean Rowing boat and Rowed the Atlantic solo. After that I decided I wanted to row back across the North Atlantic from NYC to Ireland. But I discovered 2 days before my flight to New York I had a stress fracture in my back so I cancelled the expedition. So it was a good 18 months off! I spent the best part of 2 months recovering from the back injury and also recovering from the initial row which took more out of me than I cared to admit. I was making the rounds as a public speaker, visiting schools and business telling people my stories. I wasn’t sure if this was the full time path for me so I decided to go back and doing some of my trade as commercial saturation diver. I picked up a contract in the Middle East with a company I had worked for in the past. I ended up spending 10 weeks mid summer in Saudi Arabia. Half of this time was spent inside a small chamber and on the sea floor doing heavy construction. Halfway through the trip my back started to feel a bit iffy, a similar pain to what it felt like not long after the row 4 months previous. Had I broken it again? Diving is a tough job on the body make no mistake about it, one of the reasons is you can be up to your waist in mud and trying to maneuver large bolts and studs into pipe flanges, proper manual handling techniques go out the window, it turns into a wrestling match of sorts. My head did a number on me and I spent the 2nd half of the trip worrying which of course compounded everything. Emmet at Galway Bay Physio being kept busy. After I got home I went straight to see Emmett at Galway Bay Physio and he felt it was just the ligament that was a bit aggravated, the specialist confirmed this a few days later. Having not really done any training in months I was looking forward to cycling, running, swimming and generally moving around on terra firma a world away from a small chamber and the dank sea bottom in the Persian Gulf. September was all about getting moving again. My body hurt after my first slow run. I had 5 months to Iditasport in Alaska. This race is the pinnacle of Ultra Endurance Winter racing and perhaps one of the gnarliest things out there. When I first took part in Likeys 6633 Arctic Ultra In 2015 I always knew I wanted to get to Alaska. The Iditasport is actually the lesser known race, the big one is the Iditarod Trail Invitational, which has been on the go for over 10 years. The Iditasport race used to be around in the 90’s and after it went defunct The ITI came along. Last year the Iditasport organization came back thanks to Billy Kotsich and it staged a 1,000 Mile edition again as a 20 year anniversary. My friend Jan Kriska raced it, I followed him closely during it. It was in Feb/Mar of this year when I just back from the row. I was envious and knew then I had to try do this race. When I had news on my back and pulled out of the row back across the Atlantic my head switched instantly to Iditasport and to enter it this year. Jan had a really tough time on the trail last year. He made it 600 miles along the trail which is a huge feat as the winter up there was particularly harsh, in a year when noboady from either race finished the 1,000 mile edition. The Iditasport and ITI really ride on the back of he Iditarod Dog Sled race. That’s the big event there every year and has been for a very long time. The Iditarod Trail is a historic trail the crosses Alaska from just out Anchorage to Nome on the Bering Sea, spanning 1,000 miles or 1,700km it is truly a mammoth challenge for a man and dogs, but for a man alone with a sled it is mind boggling. There are very little roads in Alaska yet there are many towns, during the winter the trail joins these towns via the frozen tundra, lakes and rivers. The Iditarod dog sled race helps bring something to each of these villages that otherwise wouldn’t see much else being located in the middle of nowhere. Each year the race changes the route slightly in the middle section on odd years it takes a more southerly route and on even years it takes a more northern route. 2018 is the Northern Route and i'm already busy studying maps and gps tracks to figure out the towns, villages and stops along the way. The race is supported with checkpoints upto the 600 mile mark and beyond that you're on your own. So I have to organise my own food drops via the post offices in the villages along the way. US Post has an awesome set up where you can mail yourself a package and pick it up from said post office much like parcel motel, they will hold it for 30 days and send it back to where it came from if you don't pick it up. So i've plans to head over a couple of weeks before the race starts to mail packages. The only problem being the opening hours of the post offices, no use arriving into a village at 7pm knowing the post office won't be open for another 14 hours! So i will have to overstock each mail package and bring extra supplies between villages incase i need to by pass a post office location. Everytime i revisit my website i'm scared by the countdown timer on the main page, today it reads 67 days and i feel no way ready. I picked up an quad injury when i was in USA last month and it's not fully healed. To say it's been a frustrating year for injury is an understatement. But it teaches me humility and i need it by the bucket load. But it's all happening, planning can still be done and also some new exciting sponsors are getting involved, more on that and more blogs soon! Well I'm barely off the Atlantic Ocean and I'm heading back for more! Last night on the Late Late Show, Irelands big news chat show, I spoke about my past and what led me to row the Atlantic solo in the first place, then got to say the very exciting news about rowing back across the Northern route from New York to Ireland. Approximately 3,000 nautical miles. I used to have a chuckle to myself all of last year when people balked at the price of my Ocean Rowing boat and quickly assumed i'd be selling it after I'd finished. Not a chance, this was such a huge investment into myself, I was hardly going to sell it and go back to being normal. The trade wind route has been rowed solo 123 times sucessfully. The Northern route only 15 times, there are many starting and ending points. Newfoundland and Nova Scotia in Canada, Cape Cod and NY area in USA. To Ireland, UK and France, ranging in length from 1,500 Nautical Miles to over 3,000. With the Gulf Stream and it's northern extension - The North Atlantic Drift are a huge factor in getting across. of course it will be nice to get a push on from these but it's not as simple as that, the currents often have huge eddies coming off them. Rowers in the past have sometimes been stuck in one of these eddies travelling in a anti-clockwise direction for upto a week. Before being able to pop out the other side. Forecasting these is tough, but I will have a temperature transducer which will help indicate whether or not i'm being taken on a merry go round, the goal is to stay away from the colder water. Not only all that but last time you looked out the window in the middle of a so called summer in Ireland it could be mistaken for winter. The North Atlantic loves to throw up big summer gales and storms. Only last year Stein Hoff had to abandon his attempt to row solo after a 55 knot and 8 meter sea battered him and his boat. I have warned loved ones already there will be a point on this crossing when we are all going to be very very scared. Gulf Stream coming off USA and Canada with alot of eddies and counter currents. Setting off from Battery Park on the tip of Manhattan will be amazing yet a tricky under taking. This is the exact point the 2 Norwegian born Americans Frank Samuelson and George Harbo set off from, they were the first men to row an ocean and did so in 55 days back in 1896. Trying to get the exact conditions will be tough. Leven Brown and his team including Galway man Ray Carroll rowed this route in 2010 breaking Samuelson and Harbo's 114 year record of 55 days. Yes they were a 4 man team, but did it in an incredible 43 days. Leven who has helped me with weather routing for my crossing told me about them having to wait 6 weeks before finding the right conditions to get away from the continental landmass. Leven and crew flying down the Hudson River after leaving Battery Park. So my boat Doireann is now snug inside a container and about to be put onto a ship in Antigua to travel to NYC. I've alot of work to do over the next 3 months! Henry and myself are having a proper sit down to draw up a battle plan after the weekend. Time is tight, I need to get her cleared of customs in the USA, find storage and then do some mods on her such as - add extra power (less sun up this side!) either another battery and solar panel ,wind turbine or fuel cell, temp transducer, oar stanchions and lots of small things. All that and trying to get another load of weight back on to me, currently up at 77kg. So with all that I hope to row into Galway sometime this summer, Rowing both ways within 12 months, the first solo from USA to Ireland, maybe even a speed record, if you like all that stuff great. But i'm rooted in adventure and the challenge, maybe this will close the chapter on Ocean Rowing in my life or not? Stay tuned. How are we tracking Gavan and the rest of the fleet taking part in the Talisker Whisky Atlantic Challenge? The Yellow Brick tracking you see on the Talisker Challenge broadcasts every 4 hours. However the rowing boats also car the Automatic Identification System (AIS) transponder system which broadcasts every couple of minutes. It is quite a simple system as it shares the VHF radio on the boat and often its aerial. Other ships pick up this signal and the information contained within. This includes boat name, the unique MMSI identifier number, boat length speed and direction. Ships transmit even more information such as where they are going and what port they last visited. This system has been a huge addition to safety of life at sea but it is also great for just snooping around the world. In addition to ships picking up each others information once they are within broadcast distance of a shore base station e.g. Galway Coastguard Radio mast on Tonabrocky the signal can be further transmitted over the internet. This allows you to track ships around the coastline anywhere around the world. The odd time you see a target going at 120knots, this is typically a coastguard rescue helicopter who carry marine as well as aircraft transponders. If you zoom into busy shipping lanes such as the English Channel, near Rotterdam, Shanghai, LA, etc the number of ships will surprise you. In recent years satellites have begun picking up the VHF signals from mid ocean AIS units. The satellites have an unimpeded view a few miles above the ship. On some sites you can see the ships offshore but cannot identify them without paying for a subscription. The most popular sites are www.marinetraffic.comwww.vesselfinder.com and www.shipfinder.com. If you google AIS trackers you will find them. The Talisker Rowers can be seen on the AIS now but its hard to identify them and you get no details. However once they get within reach of the shore you can fully identify the boats and get full information. The rule of thumb for VHF is 'metres high miles wide’ ,so a 10 meter high aerial will reach 10 nautical miles. Weather dictates a lot and often the range is further. Unfortunately the rowing boats aerials are only about 2 metres high. The height of the Antiguan Coast guard Radio Masts will determine a lot but Technically this “may" allow us to follow the last 10 or so miles of the race minute by minute.Given how close it is now there will be plenty of us doing so. You can input the name of a vessel and search for it. The most recent search for Doireann on shipfinder shows her south of La Gomera Canary islands on 14 Dec, its last satellite position was seven hours ago. vesselfinder was 16/12 off the Canaries while Marine traffic spotted her on satellite 10 minutes ago. Here is a screen grab of a "familiar pair of pleasure craft" targets heading towards Antigua: I'm sure they would argue about the ‘pleasure’ denotion but Rowing has not been designated a colour - yet. Gavan is a close friend of mine. We met through mutual friends in the Jes when we were in our teens and we've been close for over 16 years now. I've seen first hand the struggles he had when he was younger and the tough journey he had to go through to recover from them. The strength he has gained from those experiences are now huge assets for him. I can see that strength shinging through not just on his challenges and adventures... but in every talk and speech he makes about his journey. I am a primary school teacher and I teach 5th class in Scoil Bhride, Shantalla. Gavan is a big supporter of the school and the students in turn are big supporters of him. He has made many trips to the school over this past year and he has gained actual hero status amongst all the kids here in Scoil Bhride. When the kids learned of his latest challenge to row solo across the Atlantic, it caused a huge stir in school, so it was inevitable that he would be back in again to dazzle the kids with his newest undertaking. This time he had Doireann, his ocean rowing boat, in tow and he attracted the attention of RTE News who were on site on the day to report on the days activities. Throughout the morning every child in the school, from Early Start to 6th class, got a chance to not only meet Gavan and Doireann but to get on board and have a look around in what would become Gavan's home while he rowed across the Atlantic. The entire school body milled around the boat and asked numerous questions while RTE filmed the action. He took the time and interest in every kid and made sure they all got a look in his cabin to closely examine all the technology and supplies needed for such a trip. However, the kids demanded more! The school then had Gav come into the hall for what turned out to be a marathon question and answer session. I think the kids would have stayed there for hours asking him questions and while he gave all his attention to the kids and their questions we eventually had to call a halt to the talk. There was such an atmosphere of excitement and curiosity on that day and it has continued right the way through this adventure of Gavans. The kids all follow him on the tracker and there are daily reports of his progress as they figure out every day how far he has travelled. They feel so involved in his ups and downs out at sea. It made their day last week when I told them that we were going to ring him and he was going to do an exclusive interview with us. They had read all his tweets, blogs and updates, watched the Talisker race documentary from last year and 'dot watched' so they were well prepared with questions and words of encouragement for him. He took time out of his hard daily graft of 16 hours of rowing to chat to the kids for about 20 minutes and it was magical to feel the excitement in the air. We are so proud of him and we can't wait to see him back again with all his tales of adventure from the Atlantic. 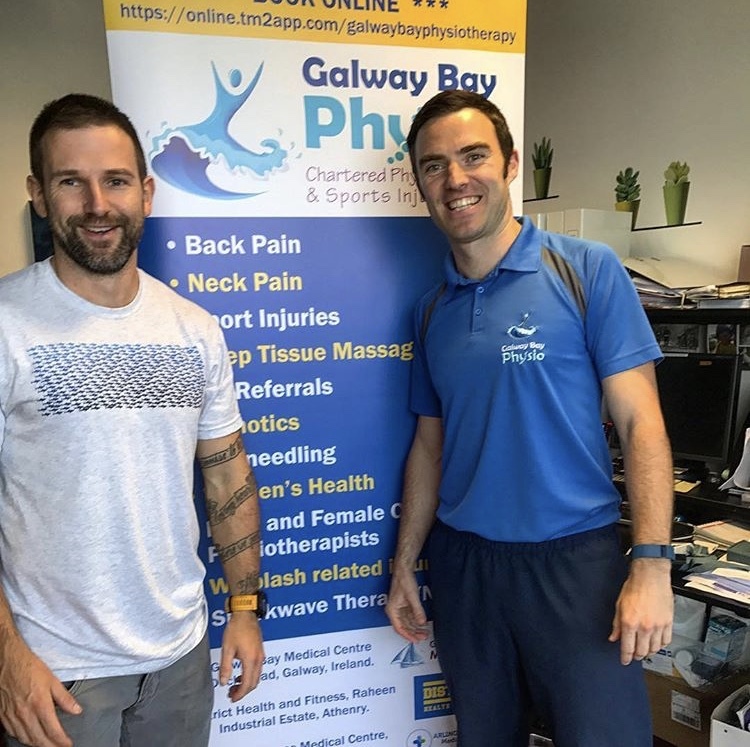 Gavan's Chartered Physiotherapist, Emmet Hartigan gives us some background and insights into the work and preparation they did together ahead of Gavan's adventure across the Atlantic Ocean. It was about a year ago when Gavan and I sat down for a coffee in Salthill, Galway and he told me about his plans to row across the Atlantic for charity. One of the first things I thought was “you’re going to need a lot of physio!!!”. Not because Gav is in any way injury prone but due to the scale of this challenge and the massive physical toll it would have on his body. The number of hours he would have to spend training for it would be an ordeal for anyone’s body. Thankfully Gav was keen to get my thoughts and jumped at my suggestion that we work together to get him as physically prepared as possible. The work began almost instantly. Gav and I sat down down again shortly after this to chart out how his training programme would progress over the year, other events which he had already planned, how these events would change his injury profile, and how best to tackle this challenge from a physiotherapy perspective. The first challenge we had was that Gavan had a number of adventures planned in the interim which had nothing to do with rowing!! Gav was already well into his training for his second attempt at the Yukon Arctic Ultra Marathon and of course while dragging a tyre for 12 hours a day around the back roads of Connemara he caused significant wear and tear to his calf muscles, glutes and left ankle. We had a race against time to diagnose and treat his ankle before he flew to Canada for the race. After a battery of testing we tired several approaches to treatment, deep tissue massage, taping, dry needling therapy, ankle and joint moblisations, ultra-sound therapy and altered his footwear to optimise his ankle and foot position when running and walking. While we made good progress the timing of the race and and the intensity of the training meant that Gavan carried that injury a little into the race with him. Thankfully he managed it quite well and it only bothered him towards the end and he still managed a fantastic 2nd place finish!!! On his return to Ireland we put together an extensive flexibilty regime to improved his overall movement in preparation for his next challenge – the solo trek across frozen Lake Bikal in Siberia. Gavan at this stage also began to start his rowing training in earnest and was spending 2 hours daily on the rowing machine in his apartment. This resulted in some lower back and hip flexor tightness. It was however always going to be part and parcel with the training regime, as well as the race itself so we worked extremely hard to maximize his movement in these areas. Gav would attend regularly for soft tissue massage, myofascial release, dry needling therapy, correction of exercise technique and tweeks to his programme. And from time to time he would come in just for a quick motivational session (i.e. a scolding) if he started to lag on his injury prevention work. Gavan had one significant injury over the year which came on as a result of training for and competing in both the Art O’Neill challenge and an ultra- marathon run across the hills from Westport to Achill. Due the his training load and the development of trigger points in the gluteal muscles he began to have pain, loss of power and some strange sensation in his left leg. He required extensive work on his lower back, gluteals and muscles of the leg as well as a re- education programme to ensure his core and stabilizing muscles were firing correctly. One of the most unique aspects of working with Gavan for the Talisker Atlantic Challenge was trying to anticipate his needs after 30-40 days of rowing and in the confined space of his boat Doireann. We spent a session in the boat itself discussing what his priority areas would be and modifying a maintanence programme which he could complete while on the water. Obviously this took some thinking outside the box and a bit of trial and error. Some of the work would also be weather dependent as the size and direction of the swell could seriously affect the ability to carry out the programme. Through a lot of hard work, good planning and treatment Gavan started the race injury free and in great shape. The race will of course take it’s toll but the fatigue, sleep deprivation, cuts and bruises will likely take a far worse toll than any muscular injuries he will suffer. One thing I know for certain is that I’ll be seeing quite a bit of Gavan when he gets back from Antigua. I’m not sure what adventure he has planned for later this year, but we’ll start again and make sure he’s ready!!! From a nature perspective, what can Gavan expect to see out on the Atlantic Ocean? While Gavan is in one of the most remote spots on the planet he is not totally alone. He is now in flying fish territory and has already come across some. They have the habit of unexpectedly landing on deck unannounced a they escape pursuit of bigger fish. BBC have a great clip showing these amazing creatures escaping predators. It is not unusual to find one dead on deck in the morning in this part of the ocean. While edible they are quite small and very boney. As he moves further west he will start to see more wildlife. He has already come across whales in the distance. This isn’t his first encounter though. Off the Cork coast last summer, on the morning after his first solo night passage he saw his support boat photographing a nearby Fin whale. It was then that he realised the source of the booming spray noise he had been hearing alongside him all night. Fin whales are about 15m long, over twice the length of his boat and a whole lot bigger. This one had been keeping him company as he approached The Old Head of Kinsale a well known feeding area for whales. Whales are curious and often approach boats at sea, especially when they are in remote places offshore. They are also very plentiful around the Irish coast, check out www.iwdg.ie to see the latest sightings. Gavan was a guest on Celtic Mist, the Irish Whale and Dolphin Group’s research boat, in Baltimore last Summer. Simon Berrow, the CEO of IWDG supplied him with identification charts to carry on board so he can now tell which of these huge animals is paying him a visit. A small black bird appeared near Doireann a few times in recent days. He hasn’t managed to identify it yet and is striving to get a photograph. This will be important 'cos given his current practice of rowing on a couple of hours sleep he may have to be forgiven for hallucinating. Finding land birds out to sea is not that unusual. They can get caught in weather systems or simply hitch lifts on ships. As he gets into more tropical waters he will likely see turtles, very colourful fish and more sea birds. Hopefully he will get some underwater footage with his go-pro. The most abundant wildlife Gavan is encountering is actually unwanted! barnacles and weed are growing on Doireann’s hull. The boat has a coating of antifoul which is a thin paint containing copper which discourages growth but does not eliminate it. Once the water is warm the surface of the boat offers a fine home for a variety of critters and plants. Ships have struggled with fouling for centuries. Very toxic coatings did work but were thankfully outlawed for environmental reasons. All sorts of materials have been tried but mother nature keeps winning. The growth on a ship can extend over 1 foot thick which slows the boat down and increases fuel costs considerably. The effect on Doireann is the same so Gavan has taken to hopping overboard and swimming under the boat to gently scrape the surface clear of the biofilm before it grows enough to create drag. Apparently the little hole for his watermaker is a favourite spot for them to congregate and this needs to be particularly clean to ensure good flow. If he really wanted company he could allow the growth to happen on the hull. It acts as a dinner table for various fish that come along to nibble on it. Handy if he needed to go fishing! Gavan was hit by some very heavy weather on Saturday night. He strived to maintain forward momentum but the weather gods were mightier than he. It started to knock him backwards. Yards and meters are hard earned out on the open ocean and he was determined not to lose too many of them. He deployed the sea anchor to halt the African pull. It was on a short rope initially but he was still drifting at over half a knot so he put it out on a longer line and that held him steady. He could do nothing more at that point but ride it out and watch for changes. He stayed on deck, on oars, in high seas and roaring wind as rain drove at him like pellets. Waiting for his moment to come off anchor and launch into rhythm again. It wouldn’t come though. He sat there for what seemed an eternity. He had very little sleep over the past week and a half and so he was at the point of exhaustion by the time the squalls eventually past. He hauled the sea anchor back on board and was so drained that when he sat on his perch, his body refused to respond. He was unable to row any further. Despondent, he hit the cabin and reluctantly closed his eyes. Yearning for recovery to come so he could get back to work, knowing that the chasing crews of 2, 3 and 4 people would be trying to take advantage. He was very frustrated and shouted and roared into the cabin. The sounded vibrated around him until swallowed by the vast great openess and silence. Eventually he calmed and when he lay his head down, sleep overcame him and he was quiet… until all the alarms his world woke him! He’d slept for 6 hours. The longest stint of singular rest he’d had since a month ago, when he set out from la Gomera. When he woke, panic hit and after doing his checks he jumped on the oars, shouting in frustration at the peeping sun as it rose on the horizon. The anger passed soon but the frustration lingered and His spirits remained low until a phone call with his mentor Henry told him that the lead was still intact. He had had a terrible night but crucially, he had not lost ground. The news settled him. They were struggling in the weather too. The flotilla was experiencing hardship in equal measure. Gavan sent us an email to post here and give you some first-hand insights into what he’s going through alone on the Atlantic. “Hey friends, followers and obsessive dot watchers! Less than 1,000 Nautical miles (1,852km) to go! Been up against the wall here. The conditions have been averse to say the least! I've had currents going against me, localised storms and winds from about every angle. The teams behind me have been making decent inroads to my lead so I did what any self-respecting soloist does... I reduced my already measly time off and rowed some more! My hour lunch and dinner became half hour breaks. I slept 2-3 hours max at night and each break during the day involved a 15-min cat nap. I've stopped totalling my daily rowing hours as it's silly amounts at this stage. On Saturday night I ended up on sea anchor and slept a little while a 12 knot northerly pushed me slightly south. I came off it at 3am and had a few failed attempts to get back rowing. My body decided to call an all stop and I slipped into one of the deepest sleeps for about 5 hours with alarms going off all sides. There is light at the end of the tunnel though and all the weather models are showing the trade winds kicking back in after what's been 10 days of character building stuff. The forecast looks unbelievable now and after that long sleep on Saturday, I’m going to rally here and up my averages a bit. If there are no hiccups again I've a good chance of breaking 50 days which is getting in before midday GMT time on Feb 2nd. Gavan is an adventurer. This is his career now. He has no corporate sponsorship. His sponsors to date have all been product based and for that he is very grateful. Gavan is looking to act as a brand ambassador and an influencer and he has plenty of life and corporate speaking experience. To hear him is to be in awe. He can offer the complete package to any corporate sponsor willing to financially support him and his adventures. Follow Gavans journey on his social media pages which are updated daily @soulogav on Twitter, Instagram and Facebook. #AskHenry - Do they use miles, nautical miles or knot(s)? Gavan has got just under 1000 Nautical Miles to go. Here Henry Lupton explains why they use Nautical Miles and why it is not metric? While lots of boaty terminology harp back to the days of the British Admiralty who charted much of the world, the infamous Cap’n Bligh having measured Galway bay, the nautical mile is a bit older and is based on something useful rather than some arbitrary distance between two points. One nautical mile equals one minute of latitude. So for every degree (60 minutes) you move north or south you have travelled 60 nautical miles. The world that we want to navigate is almost round and round things are easier to measure in angles of degrees and minutes. Its hard to drop measuring posts all over the ocean so figuring out where you are used to involve measuring the angles to various planets and stars at precise times using a sextant and referral to books of data. Its not much different from how your car GPS measures via satellites at various points above us. When the 3 dimensional Globe is transferred onto 2D paper it is done by various projections. The projection most used at sea for nautical navigation is the Mercator projection. Imagine wrapping a sheet of paper around the equator and having a light inside the globe. The parallel lines of latitude like the equator and the tropic of cancer and capricorn for instance and the meridians of longitude, with zero degrees passing through Greenwich in London, are projected as straight lines onto the sheet of paper. This projection preserves the angles of the solo rower as they row along their rhumbline from start to finish. The parallel lines of latitude spread further apart as you move from the equator to the poles which is why the land masses look distorted on some maps and charts. In a boat that is pitching and rolling around it is easier if you simply measure distance directly from that side of the chart rather than doing measurements and conversions. The electronic charts that Gavan uses have been modernised by the likes of our own Marine Institute using very precise instruments (check out http://www.marine.ie/Home/site-area/data-services/interactive-maps/interactive-maps ) and make navigation easier. However were Doireann to be struck by lightning he could lose his electronics and would resort to the paper charts and compass that he carries to find his way from mid ocean to a safe part of land. The speed of the boat is referred to in knots or nautical miles per hour. They used to gauge it by throwing a weighted rope with spaced knots over board. An hour glass is spun and the line is thrown overboard and if 4 knots run in the time for the sand to run out means you are doing 4kts. Modern boats use a spinning paddle wheel or GPS and the nautical mile is now an SI unit based on metres. Gavan relies entirely on GPS so If the Donald decides to play games with the GPS satellites we may have to go look for him! Roll on the EU Galileo satellite system. Gavan is 27 days into the row now. He's covered a distance of nearly 3000 kilometers and he's worked really hard physically and tactically to maintain his position of 1st solo boat and 3rd place overall out of 12 boats. The only two boats ahead of him are two teams of 4 people. Gavan is ahead of all the teams of two and three people and he's ahead of another team of 4. He's got about a days lead (67 miles) on the team trying to catch him. He's also ahead of the other 3 solo rowers and is leading the solo race by over 500 miles. The teams in the race have the advantage of having someone to power the boat 24/7, whereas when Gavan rests, his boat stops. So for him to be in 3rd place is extraordinary! Gavan is doing extremely well and hopes to complete the race in under 52 days which would be a new international course record for a solo rower and a new Irish record. Gavan has had some very positive interactions and some not so positive interactions with nature. He has enjoyed a meeting with pods of dolphins who have woken him early in the morning through sonar and nudging his boat Doireann. He has had a close call with a large cargo ship when he was on a collision course. He has had flying fish appear over the boat during sun sets and he has come across the notorious Atlantic gyre. He has been in an actual sand storm! ... the sands from the Sahara desert were blown out onto him and the other competitors in the Atlantic. He has caught fish, met one bird and he has swam in the ocean alone, tied to his boat for fear of losing her in the open seas. On New Years he turned the lights off on his boat, had a little emotional moment and celebrated the turning of the year under the bright and beautiful Milky Way. Gavan is coping well considering the physical and mental demands. The winds have been northerly and strong recently and because of his westerly course he is on, the risk of capsizing had been high all last week. Trying to row in those swells is made particularly difficult by the flying oars that were picked up after each and every stroke and thrown back at his face. His hands, wrists and shins have taken a pounding but as he is a trained paramedic, Gavan is looking after the wounds well. Despite the, at times, harsh environment, Gavan has enjoyed surfing the huge swells in his row boat which he has called Doireann, after his niece! Now he is experiencing more changeable weather. The winds have died down and right now he is having to work hard on calm seas, in which he is very exposed to the sun. He is having to monitor his fluid intake meticulously due to the risks of exposure and dehydration. Gavan cannot use an umbrella to take shelter as it is an automatic disqualification as per the rules of Ocean Rowing, so when he is rowing he is exposed to the direct sunlight and the reflective and refractive elements of the sea. Covering up in as option, but then heat becomes an issue over the long periods of rowing. He is rowing naked most days! It's hot and the friction from the salt causes issues with his skin. He's got some nice sheepskin mats to help relieve the friction! He also has over 650 baby wipes on board to ensure his skin remains clean and intact throughout the row. He's got a strict regimen of cleaning himself down after each and every period of rowing. You may have heard that Gavan had an issue with his arm which required him to strap his hand to one of his oars during the week to allow him to row without straining the muscle further. Gavan is mostly eating Kilbeggan porridge oats and Irish Biltong as a lot of other things have been causing him cramps. They are good fuel and easier to digest. Mentally, Gavan has proven himself to be firm and resolute in his objectives. He is in a harsh and dangerous environment but has remained calm and he has stuck to his processes. The messages of support he has recieved via email and social media has been unbelievable. Gavan sees all of these message and he is so appreciative of them. He can't always reply though. He has energy to row, eat, look after Doireann and sleep. There's not a lot left for much else after 16 hours of rowing! He is taking it one stroke at a time, one session on the oars at a time. He is looking towards the next way point and doing his best to get there as fast as he can. He has trained hard for this. He has planned meticulously for this. He has made some very good decisions out there alone and he is prepared to suffer for those small gains that keep him ahead of the chasing pack. So far he has pushed his body and mind to the extreme to achieve his goal of not just solo rowing the Atlantic but making a race of it. Gavan is an adventurer. This is his career now. He has no corporate sponsorship. He sponsors to date have all been product based and for that he is very grateful. Gavan is looking to act as a brand ambassador and an influencer and he has plenty of life and corporate speaking experience. To hear him is to be in awe. He can offer the complete package to any corporate sponsor willing to financially support him and his adventures. Follow Gavans journey on his social media pages which are updated daily @soulogav on Twitter and Facebook. Sudocream and baby wipes for the body wash! As Gavan pointed out on TodayFM on Neil Delamare's Sunday Best show, he is quite exposed and the rules prohibit the use of sun shades. He is at the 17 degree line of latitude now, well below the tropic of Cancer. The constant rowing alone dehydrates him but doing so under intense sunlight takes away even more fluid. Combine this with having to rehydrate more than 80% of his food means he easily uses 5 litres of water a day. At this point in the crossing he will have used 25 of the very big bottles of water available in shops. He will need at least that much again. The rules also require him to carry 50L just for for emergency use and he must arrive with those drums still sealed to get a result. Obviously the boats are not big enough to carry that much volume and weight so all the crews rely on desalination units or watermakers for their drinking water. Gavan has been lucky to be sponsored by Mactra Marine in the UK who lend a watermaker to one competitor every year. The smallest of these specialist units costs £5000 so this makes Mactra a very significant sponsor for Gavan. The watermaker runs off the two 12volt car type batteries aboard Doireann. You read about Gavan’s concern for sunlight to charge these batteries and the main reasons are to make water and to steer the boat. The water works bysucking up water through a hole in the bottom of the boat and then pumps it across a rolled up sheet of membrane that has holes big enough to allow water through but small enough to catch salt. It take huge pressure to force the water across the membrane hence the large power consumption. You will see a small plastic pipe at Gavan’s feet on his home page. This delivers the fresh drinking water to a 5L drum. You cannot see the tens times amount of water gushing over the side that is consumed to produce pure stuff. It takes about 45 minutes a day to make his water and he tends to do this around midday when the sun is at its strongest for maximum solar charging. In the event that Gavan has a total power failure Mactra have provided a hand operated emergency pump that would allow the production of enough water to survive. Ironically Gavan cannot simply drink the water from the watermaker. It is actually too good at removing salt and were he to drink it pure he would actually dilute his body’s own salts. So he adds salt tablets back into the water he drinks to make it isotonic. The pure water can be used to reconstitute his freeze dried food and of course he needs a bit to wash the salt from his solar panels and from his now, well publicised, nudie body. Hats off to Mactra for their huge support. Our latest blog post is by Rowena Hennigan, Gavan's older sister and a member of Team Gav, the support team for Gavan's solo row as part of the Talisker Atlantic Challenge. The new year is upon us and in our modern world we often take for granted being connected at all times; instant messages, posts, emails and tweets. When my younger brother Gavan decided to row an ocean solo, taking part in one of the most dangerous challenges on earth, gosh was I glad for modern communications. Things have really changed since morse code! Selfishly, we knew we would get regular updates and possibly (satellite location dependent), they odd text or phone call from him! Three weeks into the race, he is also keeping his family, support team, friends and growing fan base up to date by regularly posting to Twitter, Facebook and Instagram (@soulogav). It is mainly text-based messages, but he is managing to send the odd image with some beautiful insights into his world on the ocean. The Talisker Atlantic Challenge race is trackable via YB App and Talisker Race Tracker, where Gavan's fans can track his performance, see all the race statistics and check out how the competition is faring. Along with Gavan acquiring a host of new fans, he has also encouraged a new community of race "dot watchers"; a term the community has labelled themselves as they watch the dots that represent the boats plotting across the Atlantic course. Fans can then also comment and show their support with replies on Social Media. You can see a prime example below from Gavan's Mum, Julie showing her encouragement on Instagram. Needless to say, suddenly the whole Hennigan/Egan family are massive fans of Satellite Phone technology! I have read up on Iridium and was very impressed to hear they recently supported Sean Burch in his world-record success in Nepal. Satellite phone technology assists many extreme environment athletes and it is a real reassurance to family and friends of those adventurers around the world. We sleep well at night knowing Gavan is safe and well, progressing in the challenge and following his life's dreams. New weather might affect course and decisions. As the fleet hits the half way point it no longer makes sense to go further south. A weather system north of them is threatening stronger northerly winds over the coming days. It may be more advantageous to stop than be pushed too far south. This is particularly evident to the Solo rowers like Gavan who rely entirely on the wind when they rest. Crewed boats will have people rowing all the time and can keep the boat moving west. Normal anchoring isn’t possible in 4000m or water so they rely on slowing the boats with Para or Sea Anchors. This is a big cloth funnel that is about 3m wide narrowing to a 0.5m hole. Its attached by lots of light lines like a parachute. It can be 80m away from the boat so that it sinks into the big ocean swell. Gavan may chose to stop if he is going more south than west when he sleeps or while a weather system passes.Since the tracker just shows a snapshot of the boats every 4 hours you may not see the point stopped but you may see bigger differences in the velocities. Rowers Ark can be seen pointing north last night as they are in due north wind. Their speed is so low that it can be assumed they are on anchor. Gavan has decided that he will deploy his anchor if he in unable to keep more west than south. So if he cannot go WSW or better he will stop.All eyes on the Low pressure below the Azores. Hopefully it will be short lived and the Trade winds will be back helping him towards Antigua. Wind can be seen on the race tracker. It needs to be turned on in layers and is easier view on pc than mobile version. Gavan is now 15 days into his mammoth solo row across the Atlantic. He is having a stellar performance and is holding the third place he attained during the first week of the race. He is ahead of all the Teams of 2 and 3 people and currently sits just behind two teams of 4. Gavan has been regularly speaking to his support crew throughout the past 10 days and here are some of his thoughts so far. Q. Gavan, how are you enjoying the row so far? You’re killing it out there! A: This must be the longest and grandest race out there. It's just on another level compared to anything else I've done. I've the potential to be out here for months. There could be up to 2 months between the first and last boat. The logistics, planning and cost make this more extreme than anything else I've done but I’m loving every minute of it! Q: It’s Christmas time and you’re headed farther and farther south. What’s it like being out there at this time of year? A: Well firstly, the reason I’m headed south is based on historical weather data and long range forecasting. On balance, there is more wind south of the direct route than along it. Also, the further I head south and west the warmer it gets so the past week has meant that it’s felt like anything but Xmas. The days of the week are pretty much irrelevant but the guys at home are probably experiencing that at this time of the year too haha! That said, I was rowing with a Christmas hat on Christmas Day and I got in for the traditional Christmas Day Swim to mark the occasion! I also took some time out to make calls to family and friends… some of whom must have thought I was a prank call from India and didn’t answer! Q: How have you found sleeping out there on Doireann? How’s the practical side of the rowing been going for you? A: The cabin here on Doireann is nice and cosy, there's a mattress and I'm usually so knackered from rowing that I sleep well. We’ve had numerous days where we’ve had 5m groundswell and 25 knot winds. A lot of the fleet had never experienced seas like this but I’ve been all over it, catching huge rollers and maxing out at 12 knots flying down the face of these ocean swells, it was hugely exhilarating. I’ve had a few niggles on the injury front but I’ve been sticking to my exercise routine from Emmett in Galway Bay Physio to keep me in good physical health. I'm managing and treating the cuts on my hands and shins due to the constants banging of the oars on the unstable seas. It's all part of Ocean Rowing! I'm a trained paramedic though and so I'm well able to look after those little issues. On the practical side, I look after Doireann and make checks on here routinely day in day out, sunrise, sunset! I've had to be very cautious of the power I'm using and the water supply i have on board. The weather has been stormy and cloudy, so It's not been the best power porducing weather for me and the solar panels! I've also had the Khalima blowing in from the Sahara... a sand storm in the middle of the Atlantic! How weird is that! I've had to be careful with my eyes, my open cuts and again the power as the sun can't get through the hazy sand to easily and as we all know... sand gets EVERYWHERE! Q: You’re in third now and you’re surprising a lot of the dot watchers at home with your impressive performance to date. Have you come across any of the competitors out there at all? A: I saw some of the other boats during the first 6 hours of the race, but since then I've not seen another soul. We have AIS (Automatic Identification Software) on board where boats show up on my chart plotter(GPS) so over the first few days I could see some boats around me. I even contacted some by VHF radio. By now, we are well spread out and I believe the nearest boat to me now is 20 nautical miles. I'm currently punching well above my weight and sitting in 3rd overall with 2 four man boats well ahead of me. I'm tussling with a 3-man boat and there are other 3 man boats behind me. There is a lot of people behind me back home and they are mad for watching the tracker and the updates online. I get fed those messages of support from my team and all those messages keep me going through the dark and lonely nights. There is a support yacht out there somewhere but I've not seen it yet, it could be days away. Q: You’ve literally got a boat load of food out there. How has it been managing the calories and what’s your favourite snack? A: I've a varied mix of snack foods to go with my dried meals, most packs are different so each day I could pull out a pack with random sweets, protein bars. dried fruit and nuts. My favourite treats are Irish Biltong and Kilbeggan oat biscuits. Q: Any shocks or surprises out there so far? A: I was woken up during a nap on the on a few different days by a pod of dolphins. I sleep right at the water line so I could hear their sonar, about 20 of them came by for a play with my boat Doireann, who needs an alarm clock?!? It was flat recently after all the stormy weather and so I got my lanyard on and got in for a swim… I also took the opportunity to clean the hull of any growth that could slow me down. That was a bit surreal! I also got a shock one morning during the week, I was dosing in between rowing intervals and Doireann hit something hard… that’s not supposed to happen out at sea! I leaped out of the cabin and over to see what had happened and to check Doireann for damage. Luckily it was just some Ocean debris. It was solid but not sharp and after a thorough check, I was happy that Doireann was ok. I’ve been on the lookout ever since that and I’m paranoid that something bigger or sharper might bump into us now! Q: Do you want to hear about the news or be kept up to date with the world? A: Apart from the messages of support I’m not bothered about the News. The only thing I get updates on is the scores from Connacht rugby matches and news about family and friends, apart from that I'm sure the world is getting on fine without me! That said, I was so stoked to hear about the arrival of Ronan and Kari’s twin girls Annabel and Cornelia. They’re still in hospital and I’m thinking about them every day out here! Oh, and congrats to Emmett on the arrival of baby Jonah too! Q: The question that everyone wants to know Gav… how are you going to get the boat home?! A: I’ve had a lot of people asking me what I’m going to do after this challenge… I've not made the final decision on that but I’m committed to being an adventurer. That’s what I am now. I've realised this was the best decision in my life to do something like this, just yesterday evening as the sun set I could see a convective storm developing way off in the distance. It could have been hundreds of miles away, I felt like I had this entire world to myself so with the freedom this place allows it may not be the last ocean I want to cross, stay tuned! Question: How does Gavan steer Doireann as he rows across the Atlantic? Answer: How Gavan steers (while tweeting) is an important question as most failures of Ocean rowing crossings are due to problems with the steering system. Doireann has a big rudder about 1m long and half a metre wide. Its super lightweight but very strong Carbon fibre with a wing like profile. A 50mm stainless steel pole is imbedded in the rudder blade and protrudes up through the bottom of the boat into the little cabin at the back of the boat. Then a tiller arm is attached to the top at right angles. Worst case you can reach in here and move the arm side to side to steer the boat. On Doireann (and every boat will be a bit different) the arm is attached to a rope. One end goes out the left hand side the other the right, out along the boat to the front of the two rowing positions where Gav does his thing. He can take the rope in his hands and steer the boat when he is not rowing. This happens a lot in big surf where the oars can get in the way but where steering is really important for max speed and to avoid sliding sideways and being rolled over . He usually stands facing forward for this. Its a buzz and a great rest from slogging on the oars for hours on end. It can however be very tiring and when faced with 60 kmph winds for long periods its not a full time proposition. Gavan is one of two boats trying out a new foot steering system this year. This is how coxless rowing boats on the river or in the Olympics are steered. In their case the rudder is 50mmx50mm but Gavan has a relatively big craft to move. When he is rowing his feet are fixed into straps just like rowing machines at the gym. The right hand one can pivot under the ball of the foot and a little arm extends from the toe where the left and right ropes can be clamped in place. So he can swing his heel left and right to pull the rope over and back. This bit of kit was only added at the last minute so Gavan has had no time to test it out. So far he is happy with it. It has one big advantage, it allows you to turn off the third method of steering and one of the most important pieces of kit on the bot, the autopilot. All the boats must be capable of being steered by an autopilot. Its obligatory and its failure effectively doubles the time to cross. Even the pairs, trios and fours. All boats have three of them on board. So it is a kit of electrics and mechanics in a waterproof box about 400mm long and 100x50mm across- a length of 3 be 2. Inside is a long threaded rod attached to a 12v motor, electronics and a tiny electronic compass. This is placed in the little cabin at the back and can be snapped on and off the arm in place of the rope. When its turned on you can see your compass heading. you can simply press a button to keep going in that direction or you can connect to a GPS and follow a route. Normally you snap it in place and tell it to go the direction you are travelling. Then when the wind and waves swing you off that course the compass spots it and tell the little motor to push the rod in or out and bring it back on course. It means Gavan can just keep rowing without adjust his foot or have to pull harder on one or other side. More importantly it means Gavan can keep going in the right direction when he stops rowing for food or sleep or sunbathing…. Its a critical bit of kit though and this morning it is top of his worry list. He is just into his first bit of high wind big sea rowing. You cannot row and may need to lock yourself inside for much of it. As such you really depend on the autopilot. Unfortunately we had trouble with them while preparing the boat and it locked to one side while he was asleep in the font cabin and could not hear it struggling. It was replaced but we did not have time to put in some limit switches to protect it from overheating. A second one developed a compass fault and needed to be replaced just before travel. Ideally they would be tested and calibrated for different sea states so he could use on for big rough seas like today (he is in 65 Kmph wind as I write at 11am sat) and another for calm stuff. You might also swop them to reduce the burden on the motor. We need to keep our fingers crossed for this little babies. Most get christened are are consider full crew members on a boat! If they dont work, Gavan’s tweeting gets curtailed. The first of a number of insights from one of Gavan's mentors, Henry Lupton. Here Henry explains just what the VMG is on the tracket app when following Gavan. The red line is the rhumb line or shortest distance from start to finish. It is curved because, like airline routes, the shortest distance is a curve northwards (in the northern hemisphere) and it's shown on a two dimensional map or chart. They go at this time of the year because the sea temperature has dropped below 26 degrees which is the minimum needed for a hurricane to form. They go from the canaries because the prevailing wind is NE in this area just as it is SW around Ireland. The prevailing wind or Trade Winds have been used since Colombus went from La Gomera because most boats can't go directly into the wind. The reason they have gone south of the shortest line is that over the years it has been shown where the highest probability of favourable wind blows in a given area in the ocean. Gavan has chosen a strategy to go quite far South. He is better to go wide early on and then close in on the end point later. The VMG figure on the leaderboard is Velocity Made Good. This can be confusing. It is not actual boat speed. If the end point is west of him and he is travelling south west then only part of his boat speed is in direction directly towards the finish. So he could be doing 4 knots boat speed south west but his VMG might be 2.5kts towards the ultimate endpoint. If he was doing 10knots towards Africa he would have a VMG of -10kts. So the speed only equals VGM if he is pointing directly at the end point.